With the Euro Dividend All-Stars list‘s coming of age it became clear rather quickly that one dividend growth stock isn’t like the others. There are companies that offer an attractive dividend growth rate to investors for a couple of years already, but then there are also the dividend mammoths. They boast decades of sustained dividend payments and increased returns to investors. Munich RE is one of those companies. 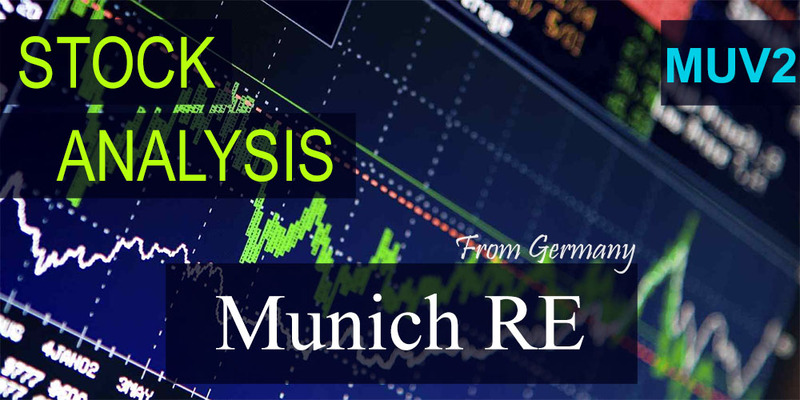 The Münchener Rückversicherungs-Gesellschaft (ETR:MUV2), or Munich RE as it’s more commonly known, is a Germany-based reinsurance company. It was founded in 1880 by Carl von Thieme, the same person behind other major German insurer Allianz (ETR:ALV). Over time, Munich has managed to become a worldwide reinsurance leader through its excellent risk and portfolio management, to which its sustained dividend payment for the past 45 years is testament. Let that sink in for a minute. This company has managed to return a sustained and often growing dividend to investors for almost half a century. What’s not to love about that? As a dividend growth investor these are the type of smashing statistics I love to see. Long-term success and growth makes up the DNA of Munich RE as it is at the core of its quality above quantity mantra. By combining primary insurance and reinsurance under the same roof, Münchener furthermore builds on broad and diversified risk management expertise that many of its competitors lack. Munich RE’s current business consists of three major segments: reinsurance, primary insurance and health insurance. The reinsurance portfolio under management is by far the largest with a premium income of about €27 billion in financial 2014. Another €18 billion in premiums comes from Munich’s second pillar, the ERGO primary insurance brand. Finally, Munich also launched a €5.3 billion health branch in 2009 to pool its worldwide health insurance knowledge. Munich’s 2014 annual report shows that its excellent returns come from a well-managed work force that is highly committed to its employer. Because of the employees’ high level of specialisation, Munich is able to rely on world leading disaster prediction. As a result, the company’s income has been growing, even though it is inherently unstable due to the unpredictability of random harm. The 2011 earth quake in Japan, for example, wiped away a large part of that year’s profits. Long-term growth, however, remains stable. With the continued accumulation of assets worldwide, the need to protect those assets through insurance and reinsurance remains present. Being the market leader, Munich RE is sure to capitalise on this trend. Interestingly, Munich forms a de facto worldwide oligopoly with its direct competitors Swiss RE (VTX:SREN), Berkshire Hathaway (NYSE:BRK.B), Hannover RE (ETR:HNR1) and Lloyds of London. One major risk to the reinsurer’s short-term profitability comes from the high dependency on the capital market. With a debt-to-equity ratio of 90% Munich’s business model relies heavily on borrowed money. When the European Central Bank decides to end its Quantitative Easing programme and interest rates take a hike in the future, this could put pressure on the company’s profitability in the short-term. Even though Munich’s income is rather unstable, it aims to return at least 25% of profits to shareholders in the form of a dividend. As previously said, the company has managed to do so since at least 1970 without lowering the payout. The insurer is furthermore committed to not undercut the dividend in future payments. Current investors receive a €7.75 dividend over financial year 2014, which is rather high in today’s market considering that the stock trades at €199.50. Even with its 20% YTD growth spurt after the ECB announced QE in the Euro area, Munich RE’s P/E ratio isn’t high with a measly 10.9. If a 3.88% yield isn’t enough to win investors over, it’s the consistency and long-term growth that make Munich RE such an attractive investment. 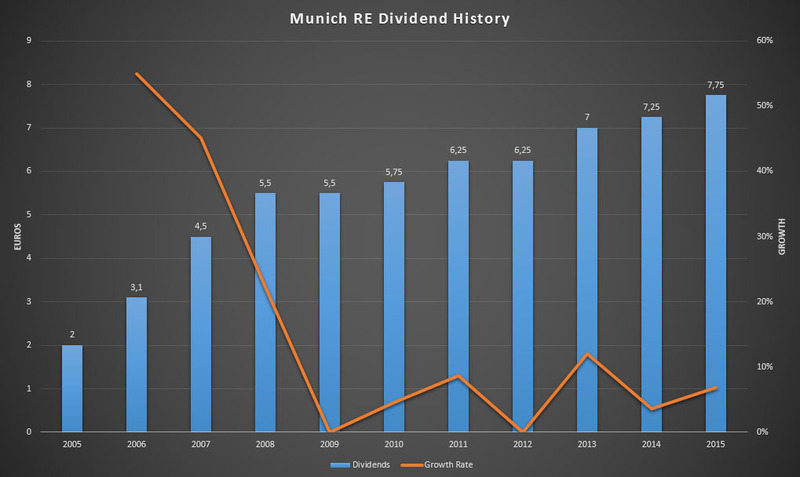 Even though dividend growth has been choppy, which is the result of the inherent unpredictability of its business model as stated earlier, Munich succeeded in growing its dividend 6.15% on average for the past five years. 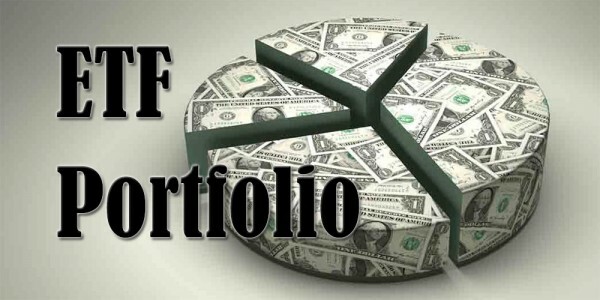 Its 10-year dividend growth rate is even higher with a whopping 14.51% annually. When considering the fact that its 2014 earnings per share come out at €18.29, the pay-out-ratio remains rather low with just 42%. As such, there’s still room to grow the dividend in the future without undermining the long-term business model. On top of the dividend payment, Munich continues a buy back programme to the tune of €1 billion worth of shares in 2014. It becomes clear then that there are some tangible risks to an investment in the Münchener Rückversicherungs-Gesellschaft, but that those risks are managed in a professional and expert manner. Even though its underlying business model is unpredictable, Munich RE has earned itself the title of a bond-type investment in many German households because of the stable return to investors over the past five decades. Another clear indicator of the long-term potential of Germany’s leading reinsurer is the fact that Warren Buffet, the legendary Berkshire Hathaway investor who built his own empire on insurance products, became the single largest shareholder in Munich RE with an 11.2% stake in the company in 2010. Do you agree with Buffett on the long-term viability of a Munich RE investment? I certainly do. I’m an italian investor, interested in this stock. I have some difficulties to understand what is the best stock exchange to buy in (ETR vs FRA or others). Can you explain me which of them is the best choice? Munich RE’s home stock exchange is the Xetra one in Frankfurt (ETR), so I would advise you to purchase your shares there. The stock has the highest trading volume on Xetra, so you’re looking at the smallest buy/sell spread. 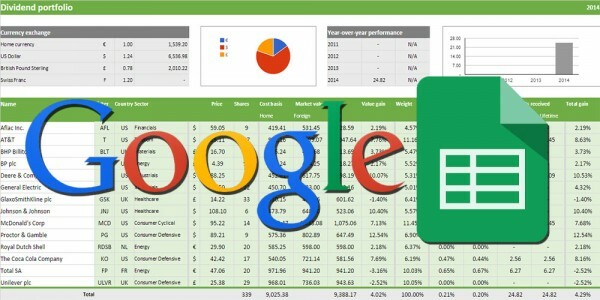 If you’re ever looking to sell that’ll make it easier too to get rid of your shares. Even though MUV2’s yield has been higher in the past, I still feel like it’s a great investment at its current 3.9% yield. You’ll be hardpressed to find such great yield and dividend stability anywhere else in Europe. I do understand you concerns, however. Personally I’ll continue to put capital to work and just add more to MUV2 if the share price declines in the future. Which is your entry price? Don’t take this as advice, but I bought MUV2 yesterday at 199.70 euros per share. I agree with you NMW. I think Munich Re are one of the all-time greats of European dividend stocks. One of the problems of investing in European stocks sometimes (which I will talk about in tomorrow night’s There’s Value post), is that they quite often hold, rather than increase their dividend, yet Munich Re has indeed managed to grow its dividend really well, with an obvious hold around the time of the last financial depression 7 years ago. That is better than what many companies achieved at that time, as many once-favoured value dividend stocks cut or cancelled their dividends. Munich Re is definitely on my watchlist, should I decide to take the plunge into European stocks anytime soon. Great to hear you’re with me on this one! European stocks do indeed maintain their dividend more often than their American counterparts. 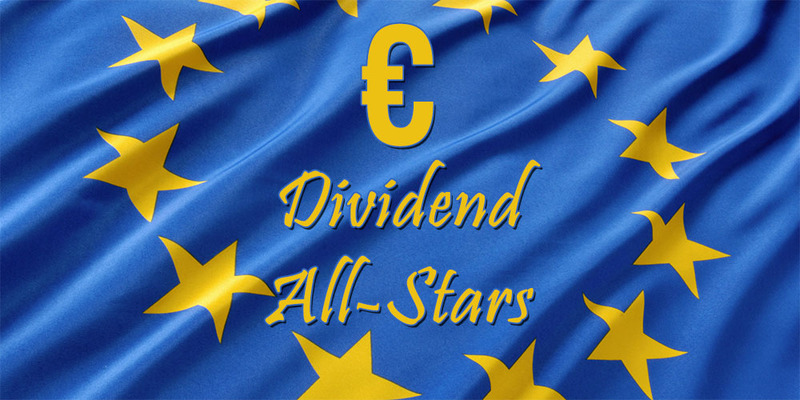 That’s why I also made the distinction in the Euro Dividend All-Stars list. Over time, however, growth is the same, so it doesn’t matter too much. Munich RE has a fantastic track record for the past 40 years, so let’s hope they continue to do so. Would love to read that you added MUV2 to your portfolio in the near future! Munich Re is an interesting stock but as a Belgian investor the witholding tax makes me very hesitant to invest in it. Most brokers either don’t or won’t help with getting a tax credit for the witholding tax or they charge outrageous fee’s for it. At least that has been my experience thus far. The German withholding tax is a bummer at around 27%, but I don’t see it as a reason not to invest in Munich RE. For Belgian investors the net yield is 2%, which is more than what many other foreign stocks are currently offering after taxes. Besides, I’ll take a 2% entry yield and 45 year long growth any day of the week! Brokers often don’t want to deal with the hassle because it’s very labour intensive. The procedure to recover the German withholding tax is overly complex. I believe my broker will only do so if your dividend income is over €100. Glad to have you as a fellow shareholder. I picked up mine between 145 and 155, I did buy them first at 155,.. and averaged down 2 times. Most of the debt that a insurance company has exist out of technical provisions in case a claims or pay outs at the end of the contract ( life insurance). Meanwhile the insurance company can invest the money, the biggest problem insurance companies are having now is that they still have a nice stream of money coming in but the interest ratio is close to 0 on government bonds. And they sustained the dividend for 45 years. But the thing that amazes me the most is that they survived 2 world wars which wrecked the company nearly twice but they still came out on top. I really like insurance stocks, if i go for financials I always go for insurance companies ( or private banking). You had a great entry price! Mine is almost 25% higher at 199.70. Too bad I didn’t have enough capital available when I first researched Munich. The debt of insurance companies is indeed to cover claims and it’s not uncommon for them to have a debt-to-equity ratio of 90%. With the current low interest rates it’ll be interesting to see if Munich finds a way to keep its profits up. I didn’t look too much into the history of Munich RE, but the fact that they survived two world wars that absolutely left the country in shambles is pretty amazing indeed. The fact that current management has only worked at Munich shows me how committed they are to building and maintaining a great business. I have never looked at Munich Re before. Very, very attractive from how you describe. I will add it to my foreign company watch list! I love reinsurance and specialty insurance companies myself. In the UK, I currently hold Amlin, Catlin and Lancashire. All highly attractive for much the same reason as Munich Re. Have you looked at Scor which operates in a similar market but in France? Thanks for highlighting this for us! PS: Just a couple of corrections. First, I think you mean “half a century”. Also when you refer to rivals such as Lloyds you put LON:LLOY. I think you have confused Lloyds Banking Group (i.e. LLOY) with Lloyds of London. Lloyds Banking Group is just a plain bank whereas Lloyds of London is the reinsurance market. Lloyds of London itself is not listed but some of its constituents (which include Amlin, Catlin and Lancashire mentioned above as well as Beazley which There’s Value recently bought into) are listed. Just thought I would point this out! Munich RE is an excellent business! Insurance can result in volatile income and profits, but the fact that they managed to sustain the dividend for so long really says something about the type of business they’re running. I’ll definitely look into Amlin, Catlin and Lancashire. Thank you for pointing out my mistakes, you are absolutely right! Yes, it is certainly a very volatile business. If you look at the earnings history of the likes of Amlin, in particular you see just how volatile it can be. However, that is par for the course with such companies and so they are always very well aware of it and have large cash reserves to cover it. That is why they seem to be able to reward shareholders so handsomely and consistently. Others in the UK include Beazley and Novae. All are far, far smaller than Munich Re though! As I said before, Scor is listed in Paris and–although smaller than MUV2–is pretty large and in the Eurozone (it is about a 6 billion euro market cap). Well worth investigating! My pleasure with the corrections. It is a very easy mistake to make! After all, Lloyd Banking Group is also headquartered in London. I forgot to point out that Scor is also on my watchlist! I still have to dive into their annual report and financial statement, but it seems like a great investment. Currently it’s offering one of the higher yields in the market too. Mistakes are easy to make indeed. I’ve learned a ton since starting this blog, but sometimes I still bump into something that’s completely new to me. Thank you for clarifiying things! 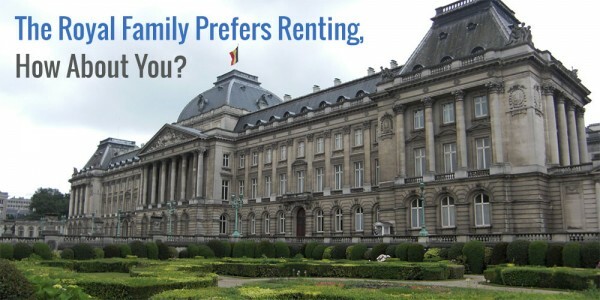 EU offer a new QE package, real estate holding is a great pick. Base on the trend in the US, after housing hit bottom in 2009, the US started QE, average increase each year is 29% for some funds. Sorry for misunderstanding your comment, but Munich doesn’t do real estate. They run a worldwide reinsurance business, which also profits from the low interest rates. It’ll be interesting to see the effect of QE on housing prices though, but I don’t think the outcome will be as pronounced in Belgium as it was in the US. Homes are already highly overvalued over here (and have been for as long as I can tell), so there’s not much more room to grow. Currently the Belgian home-price-to-average-salary ratio is the highest of all Western countries, which says something about our already expensive housing market. I hope you capitalised on the market run-up over there! My bad, thanks for the clarification. Cheers! If the market goes up to the level of New York City or Vancouver, it might be good for rental. However, america we have lots of land, materials cost the same. So,I can’t see the market will shoot up in smaller city like where I’m at. Great Analysis. I had never heard about MUV2; this post makes a great first step to start researching this reinsurance company. In my view, the beauty of the Insurance business(as a whole) is that it is timeless, making companies potentially timeless themselves. The day we have robot bodies and starships we still need to insure them. Thank you very much. I’m glad to help you discover Munich RE! That’s ultimately what these kind of posts are all about. You make a very good point on the timeliness of insurance businesses. We’ll always need to insure our assets, whether they be land, houses, robots, or space ships. With the continuted accumulation of wealth world wide insurers are sure to remain profitable far into the future. Can I just add that rising rates contrary to what you stated would be a positive for munich re? Since it is inherent to the insurance business model to invest taken in premiums (float) in the capital markets rising rates would be a huge plus for munich re. They are much more pressured by declining rates, since profits on float in such an environment are relatively little. Another thing to keep in mind that is caused by low rates is new competition. Since investors are desperate to find some yield in this market new players have entered reinsurance. Non insurance institutions are covering risk via cat bonds driving down the premiums earned by munich re. Munich re wisely decides to forego unprofitable business in the years to come, which should retain profitability but challenge the top line. Just some thoughts to consider before buying into Munich Re at 11 times P/E, which I consider as streched. You’re absolutely right about the interest rates! However, doesn’t a rising interest rate work both ways for Munich? On the one hand they can buy higher yielding bonds (for example), but on the other they’ll have to pay more for borrowed money (which they have a lot of)? In the long-run I still believe that Munich RE is an excellent addition to any dividend growth portfolio, so I’m glad to be a shareholder, even at current prices. Yeah the company is well managed apart from the ERGO business. I love that they forego unprofitable business, meaning they won´t underwrite losses. Its a prudent thing to do not to pursue market share and actually scaling back. Talking about Munich Re´s liabilities. As you said it is a two edged sword. But for Insurer Low Interest rates are a net negative. I don´t have in mind the exact numbers but when you look into Munich Re´s balance sheet you will see huge liabilities i guess in excess of 100 bn, but also you will see huge investments on the asset side in excess of 100 bn. So the 100 bn in liabilities are the earned client premiums, which Munich Re is able to earn interest on by investing those premiums. This is the beauty of the insurance business. You take in money from your clients, book allowances for eventual damages that you have to cover, and until those damages not occur you rake the profits from investing the premiums. Hence the higher the interest the more you earn on your float (Premia earned – projected damages). I suppose Munich Re also has som debt outstanding but this will be in the single billions, not nearly as much to offset a benefit from investing the float. Hope that helped a little on understanding how their business model is working. I would also love to own them in the future, as I said there might be competitive pressures going forward in the near to mid term. In the long term you will do fine I guess with buying Munich Re even at those prices. However, I wouldn´t expect the same returns as we´ve seen from 2011 until now. Best wishes, love your European dividend allstar list. I hope to find some value there! What do you think about the recent drop? Some analysts had released a sell recommendation in the last days and, looking at the technical level, I see a 165 euro a level where buying some shares. Have you some warning on this company after last analyst’s reports? See explanation above. Its a combination of ZIRP and resulting competitive pressures. If you plan to hold over the long-term you will be fine. However I would expect headwinds short to midterm. This is just not an environment you want to operate in as an insurer. I bought Munich only a couple of days ago and I still see it as a strong performer over the long-run. Even though I would have been happier to buy at current levels, I don’t regret my purchase. What’s more, the current price could provide another opportunity to build my position up even more. I also don’t pay too much attention to analyst reports. Many of them have a short-term outlook that I don’t like or their focus is much wider in scope than dividend growth investing. Philip gave a good explanation above about the short-term headwinds that Munich RE is facing, so you should decide for yourself if they’re worth it if you’re investing for the long-haul. Great advice on MUV2. Just managed to get the stock yesterday for 171 USD. You managed to snag MUV2 at a great price. I’m sure the company will do you much good over the long-run. Glad to be a fellow shareholder. Just got in at 162,9 I was eyeing this stock for a long time, in the end P/E great dividend track record and good yield made the trick and got me it. I considered Allianz for a while, but MUV2 has got a better payout ratio, let’s see how things develop with this stock. One question, when looking at P/E do you compare it with peers in the same industry or just widely with the market average? That’s an awesome price point – got me kinda jealous! 😉 I hope to add to MUV2 in the near future because I still believe it’s a great long-term pick. Allianz would be a relatively good option too, but I prefer Munich RE’s track record and lower dividend payout ratio too. I’m not too focussed on P/E ratio and don’t compare stocks directly to one another with regards to their P/E. Of course, I’m willing to pay a higher premium for consumer good stocks like Unilever as opposed to energy companies like Shell. I bought MUV2 @ 155 a year ago and decided to sell my small stake today. Warren buffet sold part of it’s stake too. Insurance market is very uncertain in the future. 1. Upward trending stock from 28.11.11, stocks starts at 108.3 Euro building in the dividend payout of 6.25 Euros on 16.04.12. Dividend notice given at the Annual General Meeting on 26.04.12, stock peaks at 118.28 Euro. Total climb – 9.98 Euro, 9.2%. 27.04.12 dividend payout of 6.25 Euro, stock gaps down and takes 48 days for the gap to close. 1a. one could have bought on 16.04.12 and sold on 26.04.12 and made 9.2%. 1b. one could have bought on 26.04.12 and sold immediately upon gap closure after 48 days (5.07.12) and made 6.25 Eurs, 5.45%. 2. Upward trending stock from 04.06.13, stocks starts at 149.60 Euro building in the dividend payout of 7 Euros on 23.04.13. Dividend notice given at the Annual General Meeting on 25.04.13, stock peaks at 158.82 Euro. Total climb – 9.05 Euro, 6%. 26.04.13 dividend payout of 7 Euro, stock gaps down and takes 10 days for the gap to close. 2a. one could have bought on 23.04.13 and sold on 25.04.13 and made 6%. 2b. one could have bought on 25.04.13, opening price and sold immediately upon gap closure after 10 days (10.05.13) and made 6.25 Eurs, 4.54%. 3. Upward trending stock from 17.04.14, stocks starts at 160 Euro building in the dividend payout of 7.25 Euros on 17.04.14. Dividend notice given at the Annual General Meeting on 30.04.14, stock peaks at 170.4 Euro, one day before. On the 30th the day of the AGM the stock falls to 166.45 Eur. Total climb – 6.64 Euro, 4.15%. 1.05.14 dividend payout of 7.25 Euro, stock gaps down and it has been 214 days and the gap is almost closed, as of today 27.11.14 the stock is at 164.20 and it needs to move to 165.45 Euro to close the gap. 3a. one could have bought on 17.04.14 and sold on 30.04.14 and made 4.15%. 3b. one could have bought on 25.04.13, closing price and would be still holding on. The stock has risen 51% from 28.11.11, it is a heavy weight stock and the dividends have increased YoY. Looking at trends the upward trend from 28.11.11 is still intact and was tested 2 times with one downward breakout which reversed in 4 days. The downward trend starting 30.04.14 was broken 5 days ago. The stock appears likely to hit 170 the peak last touched on 29.04.2014 before the downward trend started. If the stock falls below 159.66 Euro then we could see new lows of 133 Euro in 2015. I believe Buffett reduced his stake from 12% to just under 10%, but I might be mistaken. Anyway, doesn’t really matter because he’s rather negative for re-insurance businesses in the coming years – remember, Berkshire is a re-insurance company too! The main problem with re-insurers is that primary insurers currently have so much excess capital (because money is free) that they don’t feel the need to re-insure their products. They can cover their own risks without having to cede them to Munic RE. As a result, the premiums that re-insurance companies receive are under pressure. That’s what’s got Buffett worried most, I believe. And I’m with him. However, that’s no reason to leave the sector entirely and I’m glad to own a small stake in one of the largest re-insurers worldwide. Remember, sector weakness can also lead to opportunities for certain sector companies to come out ahead of their competitors. Hope you thought my point of view was helpful! What are your thoughts on shares falling most today since 2013 and the expected drop in profit in 2016? Seriously though, most insurers will have a tougher time going forward due to the low interest rate environment we’re currently in. Look at Ageas in Belgium, for example – it’s experiencing a similar drop. However, I think they’ll do fine in the long-run, so this might be a good moment to buy in again. Even if dividend growth is stagnant or slow for a couple of years, MUV2 will do anything within its power to keep the dividend going.